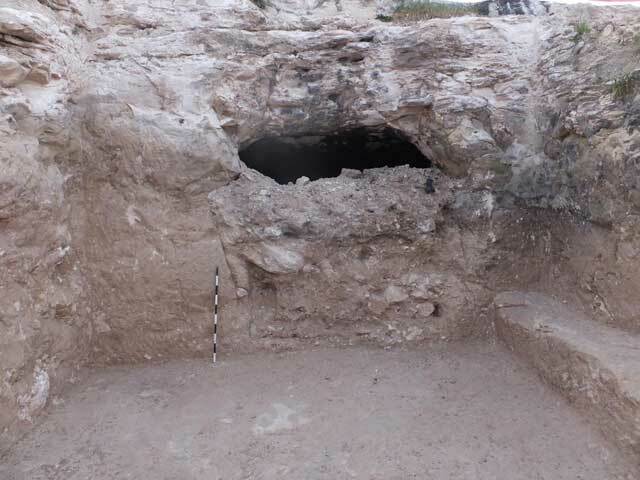 In March 2015, a trial excavation was conducted in the Wadi el-Joz neighborhood of Jerusalem (Permit No. A-7365; map ref. 222762–855/633178–314; Fig. 1), prior to the construction of educational institutions. 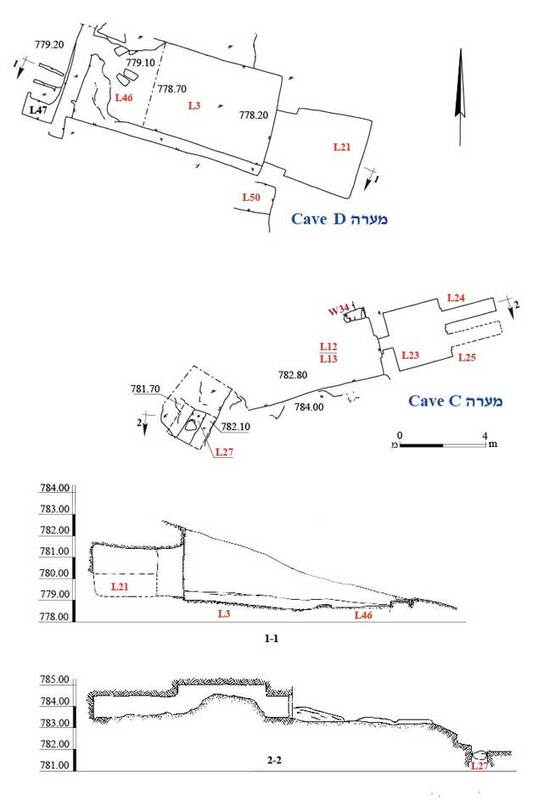 The excavation, undertaken on behalf of the Israel Antiquities Authority and financed by the Jerusalem municipality, was directed by D. Yeager, with the assistance of N. Nehama (administration), A. Hajian, M. Kahan and M. Kunin (surveying and drafting), D. Tanami (metal detection), N. Sanduka (supervision), D. Levi (GPS), D. Sandhaus-Re’em (ceramics), T. Gonen (pottery restoration), I. Lidsky-Reznikov (pottery drawing), R. Vinitsky (metallurgical laboratory) and D.T. Ariel (numismatics). Additional assistance was rendered by A. Weigmann, B. Touri and A. Re’em. 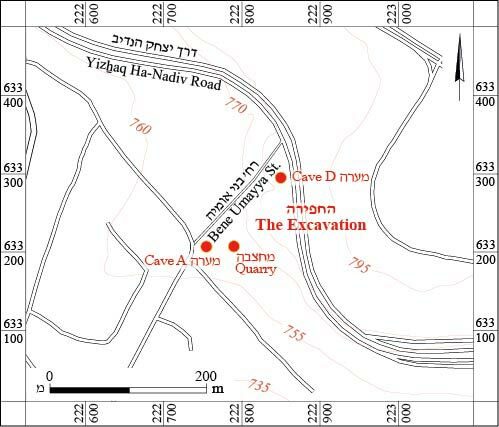 Quarries (L8, L10), rock cuttings (L17, L48) and four rock-hewn burial caves (A–D) were discovered on the western slope of Mount Scopus, descending gently toward Nahal Qidron (Fig. 2). The burial caves were only documented, without being excavated. The excavation was preceded by a survey, and the complete exposure of the excavation was done area using mechanical equipment. The slope is of soft chalk bedrock of the Senonian epoch, which has a whitish hue that darkens and becomes light gray when exposed to sunlight. 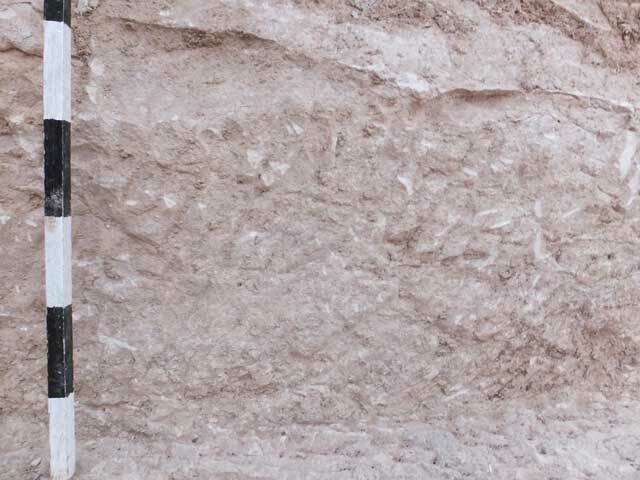 Over the years, light brown rendzina soil (0.2–0.5 m thick) accumulated on the slope, making it suitable for growing crops—am activity that continues to this day near the excavation area. There was no evidence of agricultural activity in the excavation area, where the bedrock was visible within many places. The chalk bedrock is soft and easily quarried, allowing for large hewn burial caves (Kloner and Zissu 2003:2). The excavation area is part of an extensive necropolis that surrounded Jerusalem during the Second Temple Period and comprised numerous burial caves. 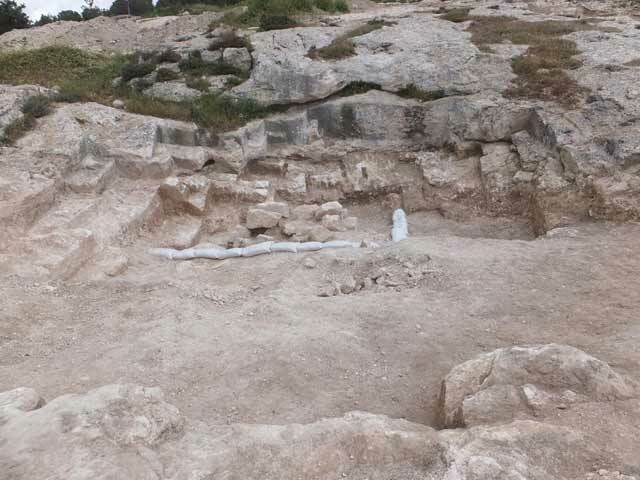 In the past, several caves from the Second Temple period, an ancient Iron Age quarry, a ritual bath (miqveh) from the Hasmonean period and a field tower from the Ottoman period were surveyed and uncovered near the excavation area (Kloner 2001: Sites 251–255, 257–259; Weksler-Bdoulah 1993:61; Re’em 2011). It is possible that Caves A and D were previously surveyed by Kloner (Kloner 2001: Sites 253 and 255, respectively). 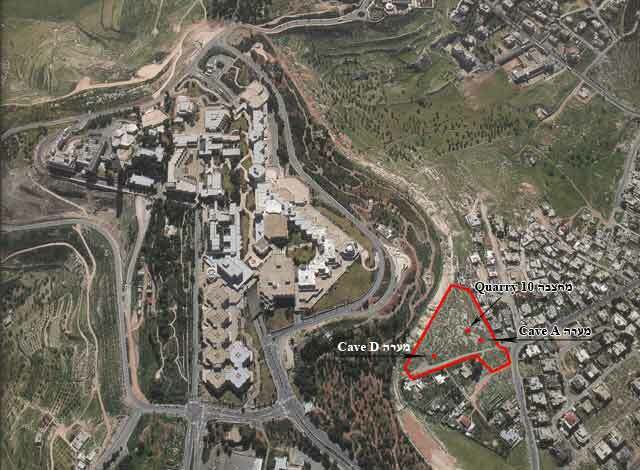 The outline of the courtyards in front of Caves A and D and of one of the quarries (L10) are visible in an aerial photograph from 1995 (Kedar 1999:139). Quarry 8 (max. depth 0.5 m; Figs. 3, 4) was shallow. Chisel marks of stones, severance channels and stones that had not been detached (average size 0.3 × 0.4 × 0.7 m) were discerned in it. At the bottom of the quarry was an accumulation of light brown rendzina and a small amount of quarrying debris. A tiny fals from the Mamluk period (fourteenth century CE; IAA 153433) was found in the rendzina. 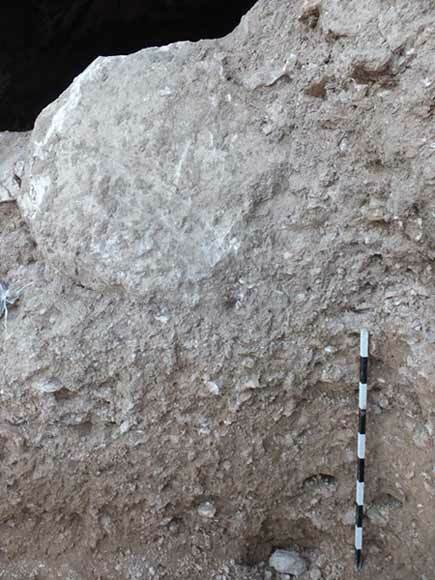 A hewn pit (L15) that contained pale rendzina, quarrying debris, chunks of stone and numerous pottery sherds was discovered in the southern part of the quarry. The ceramics date to the end of the Second Temple period (first century CE). It included fifty-five fragments of jars and forty fragments of cooking pots. This was apparently a refuse pit that dates to the when the quarry was in use or postdates this use. Quarry 10 was a small square courtyard quarry (max. dep 2.2 m; Figs. 5, 6). It included several quarrying steps bearing chisel marks and stones that had not been detached (average size 0.3 × 0.4 × 0.7 m). The dimensions of the stone blocks were similar to those of the stones that were discovered in Quarry 8. An accumulation of pale rendzina mixed with a large amount of quarrying debris (L9; Fig. 7) was discovered in the quarry. 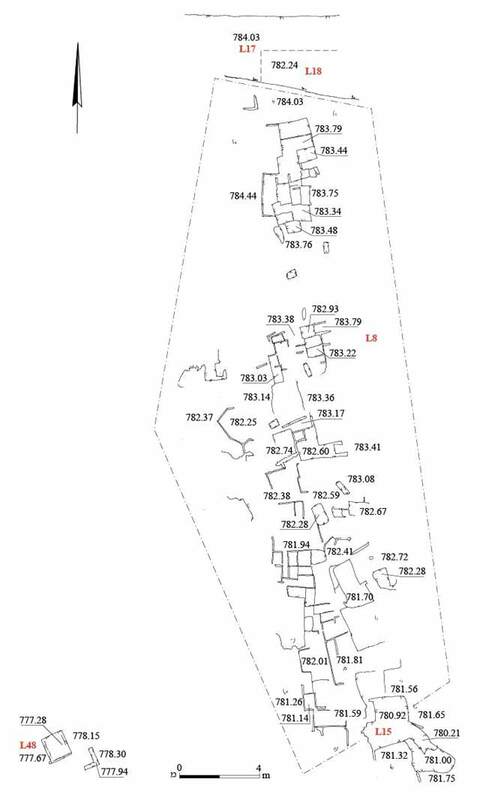 A probe (2.5 × 2.5 m) conducted in the quarry’s northeast corner revealed a concentration of building stones (L16; Fig. 8) beneath the Accumulation 9. The stones seem to have been damaged during the rock cutting or stone-dressing process, and were therefore left inside the quarry. Rock Cutting 17 (max. depth 1.8 m; Fig. 9). This was a broad, channel-like cutting that severed the northern part of Quarry 8, and therefore postdates the latter; it contained an accumulation of light brown rendzina and quarrying debris (L18). The rock cutting was probably the courtyard of a burial cave located east of the excavation area. Rock Cutting 48 consisted of a shallow square pit (1.3 × 1.3 m, depth 0.9 m) and an adjacent L-shaped severance channel. No datable finds were discovered. Cave A (see Fig. 5). A courtyard (L6; depth 5.3 m) was hewn at the front of the cave; its floor was discovered in a trial trench that was dug prior to the excavation. The courtyard was hewn on a slope that descends westward; therefore, its walls are higher on its eastern side (max. depth of the eastern wall 5.3 m). A concentration of stones was discovered in the western part of the courtyard’s southern wall. Chisel marks were apparent on both sides of the northern and southern walls. A wide opening (5 m), which led to the burial cave’s anteroom (L35), was hewn in the eastern wall of the courtyard. A thick layer of modern refuse was discovered in the room. The room led to a broad corridor (L36), at the end of which was a burial chamber (L37; presumed height c. 2 m). Antiquities robbers excavated a channel along the southern wall of the corridor; it exposed a layer of whitish gray plaster (Fig. 10) on the corridor’s wall. The walls of Chamber 37 were well smoothed and exhibited no signs of having been dressed. Two loculi with barrel-vaulted ceilings were hewn in each of the northern and eastern walls of the chamber (L38—presumed height 0.7 m; L39—presumed height 1.4 m; L41—presumed height 0.5 m; L42—presumed height 1.5 m; Fig. 12). An accumulation of soil was found near the southern wall of the burial chamber; hence, it was unclear if loculi were hewn in it. The openings of the loculi were rectangular; the upper part of the openings in Loculi 38 and 41 were arched. The openings of Loculi 39 and 42 were damaged (below). In a later phase of the cave, small new burial chambers with vaulted ceilings (L40—presumed height 1.3 m; L43—presumed height 2.2 m) were apparently hewn from the end of Loculi 39 and 42. During this phase, the original openings of Loculi 39 and 42 were probably damaged, and they were adapted for use as passages leading to the new burial chambers. In this phase, two niches for lamps were hewn along the western wall of Loculus 39, and another niche was hewn in the northern wall of the loculus, above the opening of Chamber 40. The walls of the two new burial chambers were well smoothed. A lamp niche was hewn in the northern wall of each of the rooms. 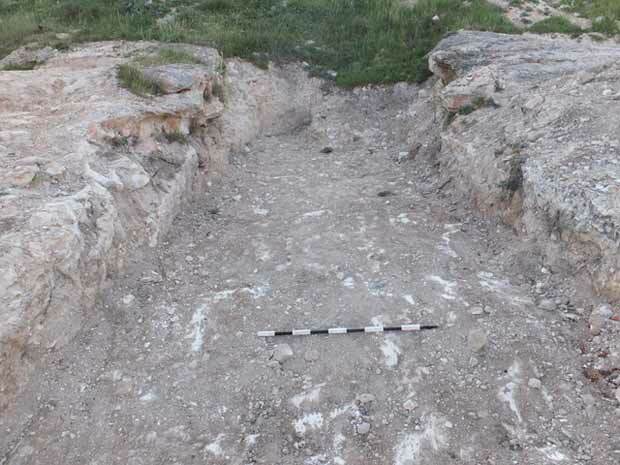 A trench that had probably been dug by antiquities robbers was found along the eastern wall of Chamber 43. An accumulation of pale rendzina that sloped to the east had been washed into the burial cave. A wide opening was discovered in the northeastern corner of the courtyard. It led to a natural cave that had a cross-section shaped as an isosceles triangle (L11; Fig. 12). A wall (W33) built of fieldstones bonded with gray mortar was built inside the cave, probably to block off the passage to the rest of the cave, which seems to extended northward. A concrete floor (L49; Fig. 13) was built above an accumulation of soil. Wall 33 and the concrete floor were constructed in the modern era, apparently when the cave was used as a temporary dwelling or for storage. Three superimposed accumulation layers were revealed in a probe (2.5 × 2.5 m; Fig. 14) excavated in the northeast of the courtyard, below the opening of Cave 11. The top layer was an accumulation of brown rendzina (L4; thickness 0.8 m) that contained sherds dating from the Mamluk period. The middle layer contained the debris of a tessera industry (L14; thickness 0.2 m): unfinished tesserae of various sizes. It seems that the origin of this debris was inside Cave 11, beneath the concrete floor. 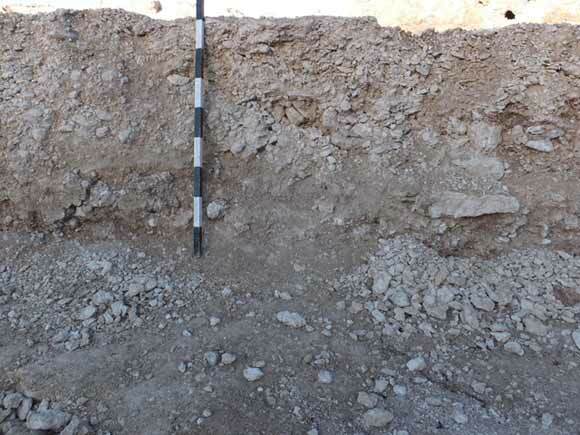 The bottom layer was pale rendzina (L5; thickness 0.75 m) that accumulated of on the floor of the courtyard. It contained potsherds of various periods, the latest of which is the Byzantine period (fourth century CE). A coin minted sometime in 364–375 CE (IAA 153432) was also discovered in the bottom layer. 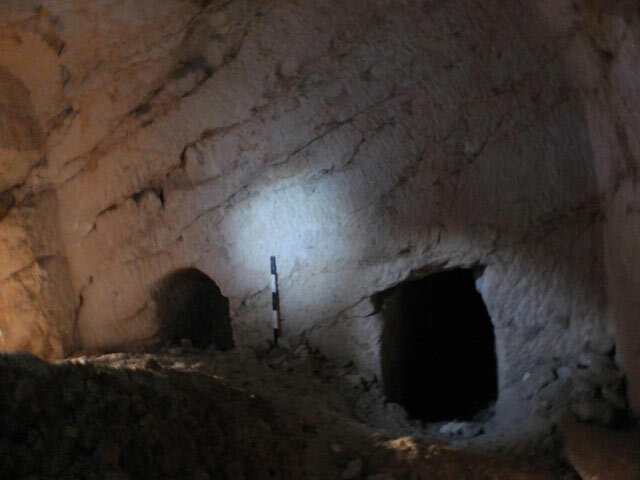 The artifacts found in the probe indicate that Cave 11 was used in antiquity as well. Cave B (see Fig. 5). A deep courtyard (L19; max. depth 1.6 m; Fig. 15) was hewn at the front of the cave. The courtyard’s entrance was set in its western wall. The walls of the courtyard were vertical, and its floor was level; it was hewn in a slope that descended eastward; therefore, its highest walls were on its eastern side. Diagonal chisel marks were evident on the walls. A rectangular opening (0.5 × 0.7 m) hewn in the eastern wall and delimited within a sunken, dressed frame (width 0.15 m, depth 0.5 m) led to a burial chamber. The chamber was square (L29; presumed height 1.4 m), and a loculus (L30; width 0.5 m) was hewn in its eastern wall; it was not excavated. A round rock-cut shaft (diam. 0.3 m) that led to the chamber was fixed in the ceiling. Pottery sherds from the Iron Age IIB were found in hollows in the courtyard floor; it was covered by an accumulation of brown rendzina. 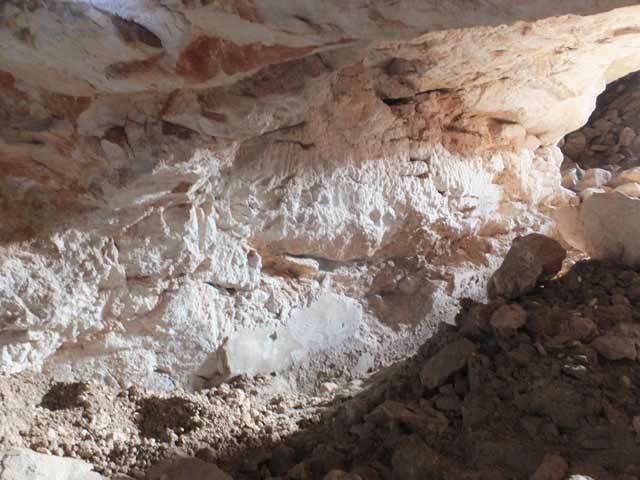 A large quantity of modern debris was also found in the cave. Cave C (Fig. 16). A courtyard (L13; max. depth 0.8 m) was hewn in front of the cave; its northern wall was built of dressed stones (W34). The courtyard floor was level, although it was hewn on a slope that descends to westward; hence, its walls were higher on the eastern side. The courtyard’s entrance was set in its western wall. Diagonal chisel marks were evident on the southern stone wall of the courtyard. 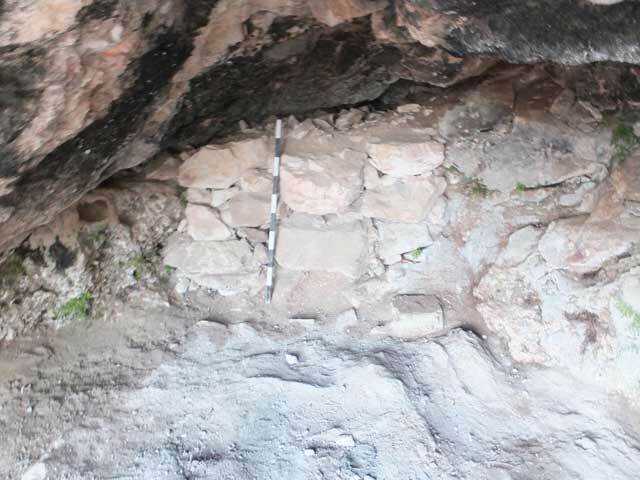 An accumulation of pale rendzina (L12) covered the courtyard; it was excavated during the antiquities inspection, but was then returned so as to prevent the plundering the cave. A square opening that led to a burial chamber (L23; presumed height 0.8 m) was hewn in the eastern wall of the courtyard; it was enclosed within a rock-cut sunken frame consisting of three steps (width 0.1 m, depth 5 cm). At the time of its discovery, the opening was sealed with a plug-shaped stone with a boss (thickness 0.5 m) at its center. Two loculi (L24—height 0.25 m; L25—presumed height 0.3 m) that had sunken rock-cut frames around their openings (width 0.1 m, depth 2 cm) were hewn in the eastern wall of the burial chamber. The burial chamber was full up to its ceiling with an accumulation of brown rendzina. A rock-cut rectangular shaft (L27; excavated depth 1.8 m) was discovered west of the courtyard. It led down to two hewn loculi (0.5 × 2.2 m, exposed length 0.5 m). The loculi were blocked with small–medium fieldstones. 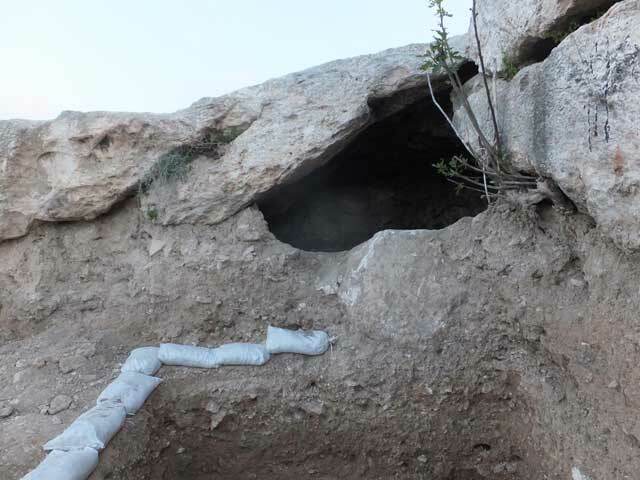 A similar Late Roman period (third–fourth centuries CE) tomb was discovered in Jerusalem’s northern necropolis (Avni 1997:33, Type 1.3). Pale rendzina had accumulated in the shaft. Cave D (see Fig. 16). A courtyard (L3; max. depth 3.7 m; Fig. 17) with an opening fixed in its western wall was hewn in front of the cave. The courtyard’s floor was level and appeared to be lower than the opening. The courtyard was hewn on a slope that descends westward; hence, its walls were higher on the eastern side. Deep and dense diagonal chisel marks (Fig. 19) were evident on the southern wall of the courtyard; a bench (width 0.5 m, height 0.5 m) was situated along that wall. The northern bedrock wall did not continue the entire length of the courtyard, and it seems that the western part of the wall was completed with construction, using the dressed stones that had later collapsed onto the courtyard floor (L46). An opening in the eastern wall of the courtyard led to a room (L21; presumed height 1.35 m) whose ceiling curved slightly to the east. Judging by the broad opening leading to it, this was probably an anteroom. Deep and dense diagonal chisel marks were evident on the chamber’s walls and ceiling, which were also covered with large amounts of soot, the result of modern activity. Soil had accumulated in the anteroom almost up to the ceiling, so that no opening—one that presumably led into a burial chamber—could be detected. The cave’s courtyard was covered with pale rendzina mixed with pottery sherds that date from the end of the Second Temple period (first century CE). Evidence of stone quarrying and severance channels was discovered west of the courtyard, probably the remains of a quarry that operated there after the burial cave ceased to be used. These roc cuttings were covered with an accumulation of light reddish rendzina. 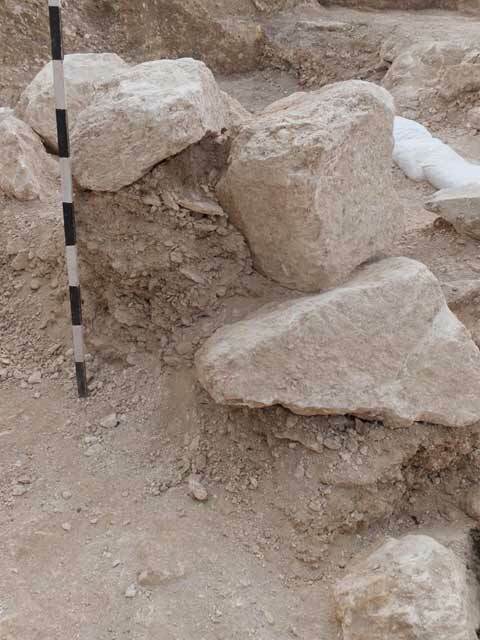 A hewn shaft (L50) that contained an accumulation of pale rendzina mixed with a large quantity of quarrying debris was discovered near the southeastern corner of the courtyard. Most of the ceramic finds from the excavation date from the Second Temple period (first century BCE–first century CE). Pottery sherds from the first century CE were found in Refuse Pit 15 in Quarry 8. These included a krater (Fig. 19:4), cooking pots (Fig. 19:5–7), jars (Figs. 19:8–12), jugs and juglets (Fig. 19:13, 14), a flask (Fig. 19:15) and two decorated sherds, one of which bears a red painted floral pattern (Fig. 19:16). A fragment of a nozzle from a knife-pared lamp dating from the first century CE (Fig. 19:17) was found in the courtyard of Cave D.
Several potsherds from other periods were also found. On the bedrock in the courtyard of Cave B were two fragments of bowls from the Iron Age IIB; one bowl has a plain rim (Fig. 19:1) and the other—a plain rim that is burnished on the inside (Fig. 19:2). A handmade bowl with a faded wavy red decoration near the rim (Fig. 19:3) was discovered in the courtyard of Cave A (L4); it belongs to the group of handmade geometric ware from the Mamluk period (thirteenth–fourteen centuries CE). The residents of Jerusalem and its environs utilized the western slope of Mount Scopus for a variety of activities, such as industry, agriculture and burial. The laws of purity which prohibited interment within the city, the view of the Temple Mount, and the soft and easy-to-quarry rock—all made the western slope of Mount Scopus a desirable place for Jewish burial. 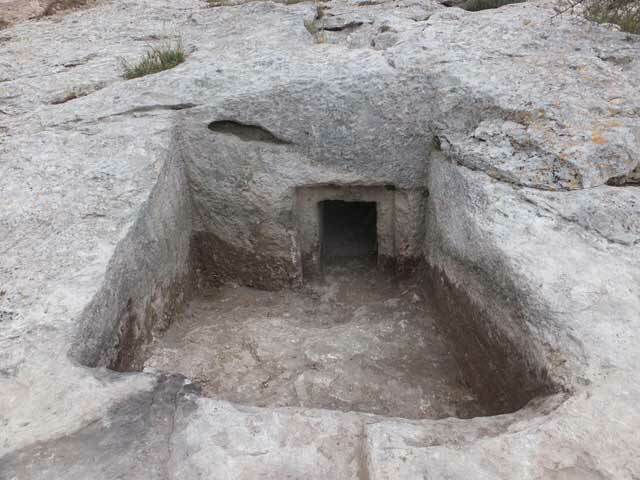 It is possible that the quarries discovered in the excavation were used for the production of stone ossuaries, which were interred in the tombs on the slope, as soft limestone was the favored raw material for producing these ossuaries. The average size of the ossuaries was a function of the length of the longest bone of an adult, the width of the pelvis and the height of the skull (Rahmani 1994:6). These dimensions are in keeping with the average dimensions of the stones produced in the quarries unearthed in the excavation. Refuse Pit 15 in Quarry 8, near the burial caves, may have been where impure pottery vessels were discarded during the funeral ceremonies. The large courtyards in front of Caves A and D indicate that the deceased interred in the caves enjoyed a high social status. After the caves ceased to be used, the courtyards were utilized for quarrying, sometimes as part of a mosaic industry. The rendzina found in the courtyard of Cave A shows that the courtyard was used for agriculture. In modern times, the caves were served as refuse pits. The practice of loculi interment in burial caves began in Jerusalem during the Hellenistic period (second century BCE). The use of bone repositories and ossuaries started in a later phase, during the first century BCE and the first century CE (Kloner and Zissu 2003:32). The pottery sherds that were previously discovered in burial caves in the necropolis indicate that the caves were used at the earliest in the second century CE and continued until the fourth century CE at the latest. The excavation results do not assist in determining whether the quarries predated the burial caves or vice versa. Judging by the finds in Refuse Pit 15 in Quarry 8, this quarry could be dated to the first century CE or earlier. Quarry 10 and Cave A are very close to each other and neither of them damaged the other; thus, it seems that the quarrymen in either of these features knew about the other. 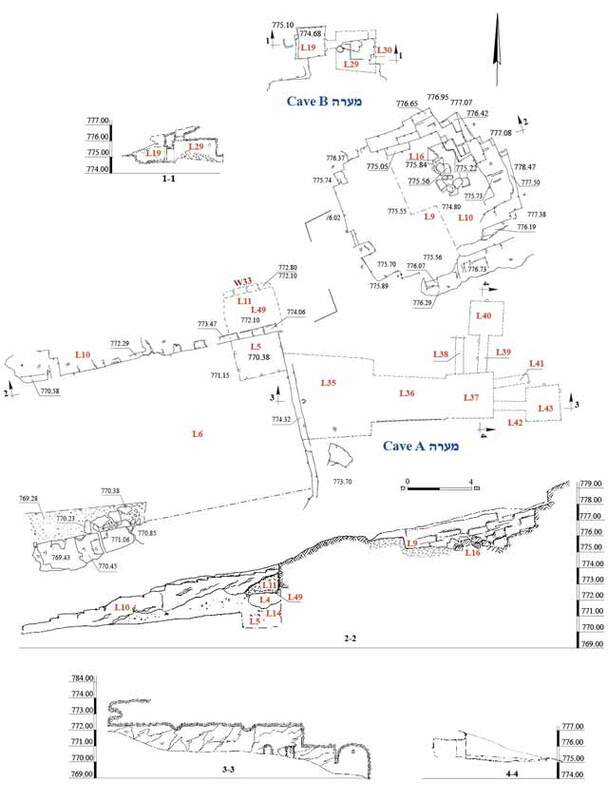 The proximity of Tomb 27 to Burial Cave C shows that the area continued to be used for burial during the Late Roman period also. Avni G. 1997. The Necropolis of Jerusalem and Beth Guvrin during the 4th–7th Centuries A.D. as a Model for Urban Cemeteries in Palestine in the Late Roman and Byzantine Periods. Ph.D. dissertation, Hebrew University. Jerusalem (Hebrew). Kedar B.Z. 1999. The Changing Land between the Jordan and the Sea: Aerial Photographs from 1917 to the Present. Jerusalem. Re’em A. 2011. Iron-Age Quarries, Second Temple Period Installations and an Ottoman Watchtower on the Southern Slope of Mount Scopus, Jerusalem. ʽAtiqot 63:27–43. Weksler-Bdolah S. 1995. Jerusalem, Mount Scopus. ESI 13:72–74. 4. Quarry 8, looking north. 5. Quarry 10 and Caves A and B, plan and sections. 6. Quarry 10, looking east. 7. An accumulation of rendzina and quarrying debris in Quarry 10, looking west. 8. A concentration of building stones in Quarry 10, looking east. 9. Rock Cutting 17, looking east. 10. Plaster on the wall of Corridor 36 in Cave A, looking south. 11. The openings of Loculi 38 and 40 in the burial chamber in Cave A, looking north. 12. The opening of Cave 11, looking north. 13. Wall 33 and Floor 49 in Cave 11, looking north. 14. A section beneath the opening of Cave 11, looking north. 15. The courtyard of Cave B and its opening, looking east. 16. 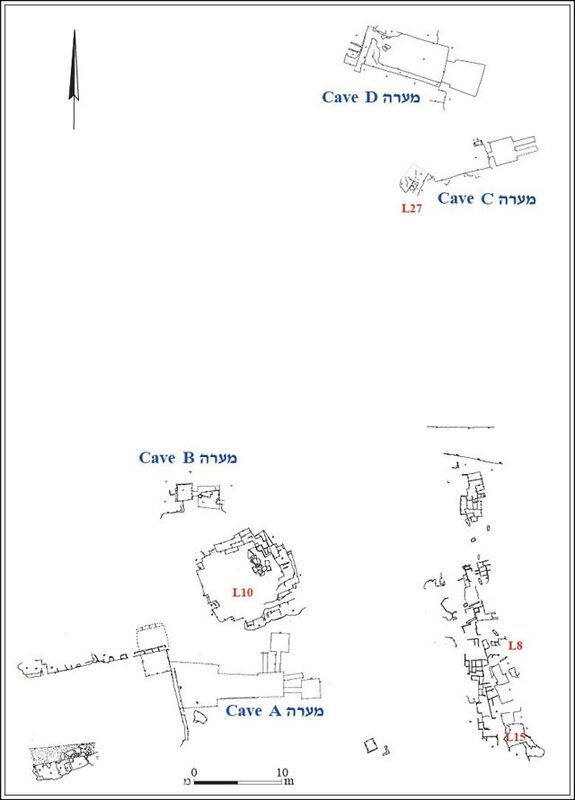 Caves C and D, plan and sections. 17. The courtyard of Cave D and its opening, looking east. 18. Chisel marks on the wall of the courtyard of Cave D, looking south.